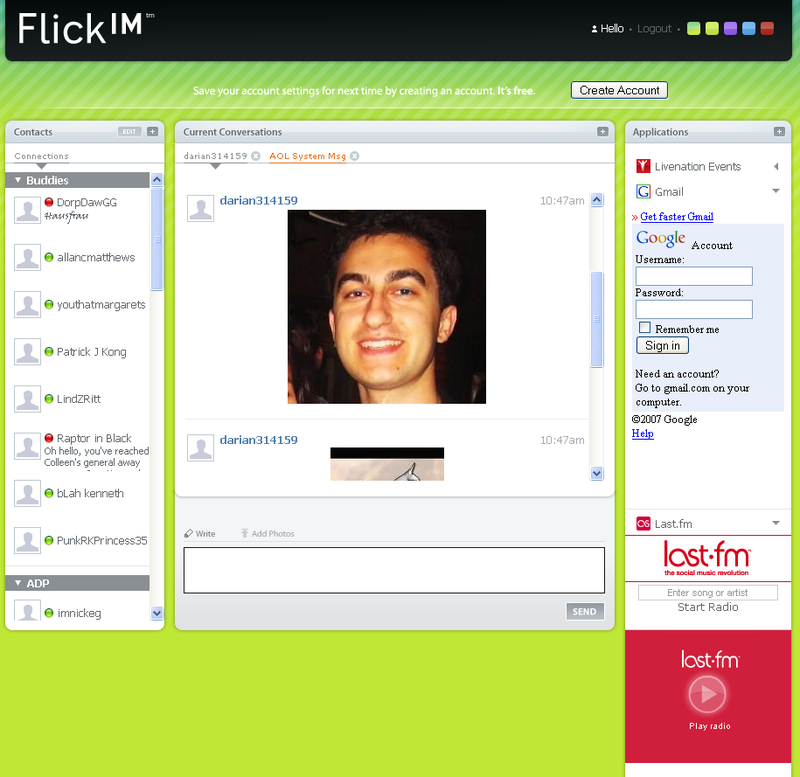 The guys who spent a lazy weekend writing a free iPhone IM client that currently has 30,000 users, Flick.IM, are back with a web chat client for AIM, MSN, Google Talk, ICQ, and Jabber. I know, another multi-service chat client – *sigh*. There’s already Meebo, eBuddy, KoolIM, and a host of other services integrating existing chat services. However, Flick.IM has a rather significant twist, they’re acting as a platform for integrating web applications into IM. FlickIM is letting applications integrate right into chat messages or as widgets along a sidebar. For instance, a Yelp widget will let users search for restaurants and send the reviews to friends through a chat message. Similar to Facebook, users will be able to add and remove the applications and notify their friends about what apps they have installed. Another startup, Imified, integrates web applications into IM, but does this for desktop chat applications through commands to chat bots. Facebook is also a company to watch for this functionality. For now Flick.IM has launched with a handful applications, but will soon let developers add their own widgets and services to the platform through an API released in the next two to three weeks. All the new applications and information will be available at Flickapps.com. While the depth of the API is still under scrutiny, it may even let developers provide contextually based services by scanning user’s conversations (with permission). For instance, if you’re talking about a movie, a Flick.IM application could automatically provide links and times for that movie. Their starting applications included six widgets and two integrated services. The integrated services allow you to embed photos and videos right into chat messages. Photos are shared by uploadeding them directly, while videos can pulled from a YouTube video search by typing “/video VIDEONAME”. Non-Flick.IM users will get links to the pictures and videos instead of an embed. Widgets include restaurant search on Yelp, Google Gmail, Last.fm radio, LiveNation, Yoink’d video search, and a beercam for kicks. The Yelp widget has the greatest amount of integration right now. It lets you run a quick restaurant search and send the link to your chat box. 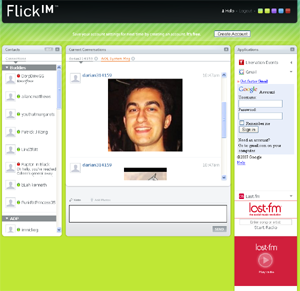 Flick.IM has broader ambitions than this IM client, with an overall focus on real-time social networking. The chat client will eventually be one of many services incorporated in a new domain to be launched in the coming months.